Thinking about computer education? FAST could be a very good option for computer education, FAST - Foundation for Advancement of Science and Technology is operating four campuses in Islamabad, Karachi, Peshawar and Lahore. I am going to focus on Lahore campus as i got chance to visit that several times. 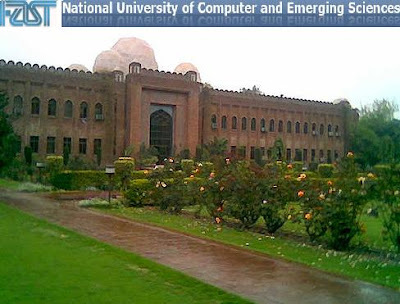 FAST with the name of National University of Computer and Emerging Sciences providing high class education in computer sciences, mid ranked in engineering and just a starter in business administration but because a huge brand name they have secure very good repute in business education sector. They have got a good and well equipped 12.5 acre campus. One plus, well plus for now days that they have got full backup electricity system. One very attractive feature of FAST is that they arranges so many seminars, workshops, exhibitions etc which not only keep them alive in news but also give their students a very good chance to interact with different people from different organizations and institutions that help them a lot to build their confidence and groom themselves. Me myself attended some of those science exhibitions. OK lets have a quick review of different aspects of FAST. HISTORY: FAST - The Foundation for Advancement of Science and Technology is the sponsoring body university. With their aim to produce high calibre scientists and technologists they step into higher education bye acquiring 4 highly ranked computer science institutes in four cities listed above. BASIC INFORMATION: If you are pioneer in something it always help you and FAST is pioneer in providing undergraduate degree in computer sciences and now they are enjoying their leadership in CS in Lahore at least. But newly started business administration is not quit making it but the brand name of FAST will surely help them to achieve the peak if they follow their on standards of excellent education. STUDENT TALK: While talking to students I was surprised with their reactions. Like they were more concerned with strictness of teachers then the standard of study. According to Hina a BBA student " teachers give tough time to us and its like difficult to get higher grades out of them but no doubt studies are of good standards" She was quit happy with cafe and labs of FAST. FACILITIES: Facilities are Above Average at FAST Lahore campus. They have good air conditioned and spacious class rooms, lush green lawns, separate common rooms for boys and girls air conditioned obviously. Computer labsss are well equipped and up to date, nice cafe with lots of variety. So overall a well deserve Above Average for facilities. MARKET WORTH: Students of FAST are enjoying very good repute in computer industry and engeneering as well but they have yet to establish their position in business administration as they have to compete with LUMS and LSE. PROGRAMS OFFERED: Currently FAST is offering these programs on regular basis. WEBSITE: FAST have a complete and comprehensive websites for detailed information about National University but Eduinn in no doubt still good for quick review. URL is http://nu.edu.pk .